In the world of consumer packaged goods (CPG), the packaging is often just as important as the product itself – if not more so. CPG companies know they need to respond to ever-changing customer needs while simultaneously keeping on top of compliance requirements and responding to internal pressures. But the truth is that the process is often far from smooth. 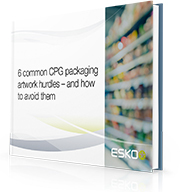 Below are six of the most common CPG packaging artwork hurdles… and how to overcome them 1)	Inconsistency issues 2)	Process problems 3)	SKU stress 4)	Compliance concerns 5)	Error and Recall risk 6)	Slow speed setbacks Find out more, download our free PDF!